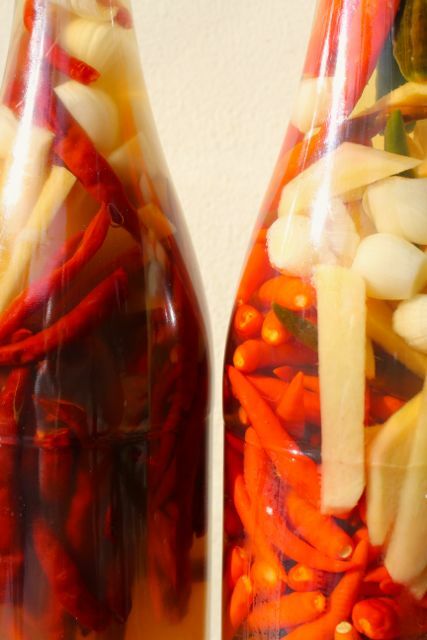 I was at the market this morning and saw some very young bulbs of garlic, some nice bird’s eye chilies and some plump rhizomes of ginger and decided it was as good a day as any to replenish the house supply of chili/flavored vinegar. I only do this once or twice a year, when the current supply loses much of its spiciness and bite. It’s so simple and results in such a good dipping sauce or spicy vinegar that every Filipino household should have a bottle or two or three. We had two nice bottles on hand, from sparkling lemonade from S&R. Bought the bottles for PHP120 or so each, enjoyed the sparkling juice, then washed out and sterilized the re-usable bottles. Next, we washed the chilies, peeled and rinsed the young garlic and ginger then individually blanched the ingredients in boiling water to remove any potential hibbie-jibbies. Some contaminated soil on the garlic or ginger that makes it into your vinegar mixture is a recipe for food poisoning. And no, the 4-5% acidity vinegar DOES NOT kill off all the cooties apparently. Place the blanched and cooled spices in the bottle and fill with the vinegar of your choice. I had several bottles of good nipa vinegar in the pantry (can’t recall where I bought them) and used that. 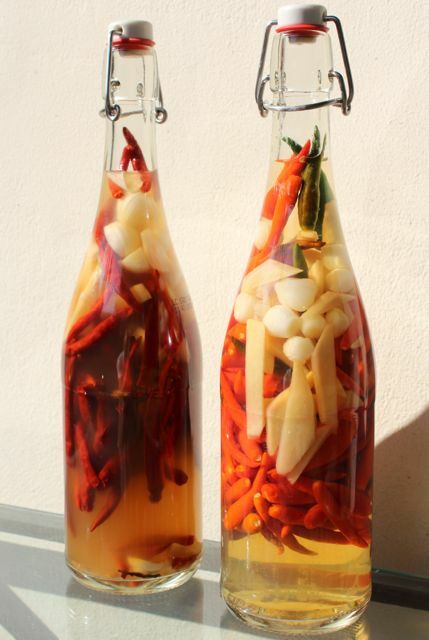 The bottles of nipa chili vinegar are steeping for a few days until they get nice and spicy. The second bottle in the photo has blanched dried thai chilies (that reader Moni brought from Bangkok) and I suspect that bottle is going to be WICKED spicy. A staff in the workplace gave a bottle of sinamak infused with lots of Habanero (Red Savinas) chilies that grew in their yard. It was wickedly hot, more like a throbbing pain of an assault. Anyway, many in the room were fooled to try kuno the “artisanal” sinamak. Just a small teaspoon was enough to send them scurrying for water. This begs the question, why hasn’t anyone tweaked the recipe to include other types of chilies? It’s a realization that people assume that the only thing one can tweak is the type of vinegar used or the amount of the recado included. By tweaking the chili type, this opens a market for artisanal sinamak. So I brought some of the Habaneros back home and made mine with more ginger and langkawas in the mix. The taste was superb, biting yet mouthwatering.